There’s more pain to come in the energy sector, with the price of West Texas Intermediate (WTI) crude oil likely to slip to as low as $30 per barrel by mid-2015 and recover gradually over the next two years. A V-shaped rebound in oil prices to about $70 per barrel would set the stage for another downdraft; US shale producers would accelerate their drilling and completion activity, adding to the supply glut that’s pressured prices over the past eight months. Most pundits in the mainstream media spend too much time scrutinizing short-term swings in the spot market, where oil is available for immediate delivery. In reality, the shape of the oil futures curve has important implications for the next move in oil prices. WTI fetches about $50 per barrel on the spot market, less than half last summer’s high. Nevertheless, futures prices for WTI and Brent—an international oil benchmark—haven’t weakened enough to discourage oil from piling up in storage facilities, a trend that sets the stage for more weakness in the first half of 2015. On Dec. 2, 2014 (the blue line on the graph), WTI traded at $67 per barrel in the spot market, while the price of oil for delivery in January 2016 hovered around $69 per barrel. Over the next three months (the grey line), WTI’s spot price tumbled to about $50 per barrel; however, the price of oil to be delivered in March 2016 slipped to only $61.50 per barrel. 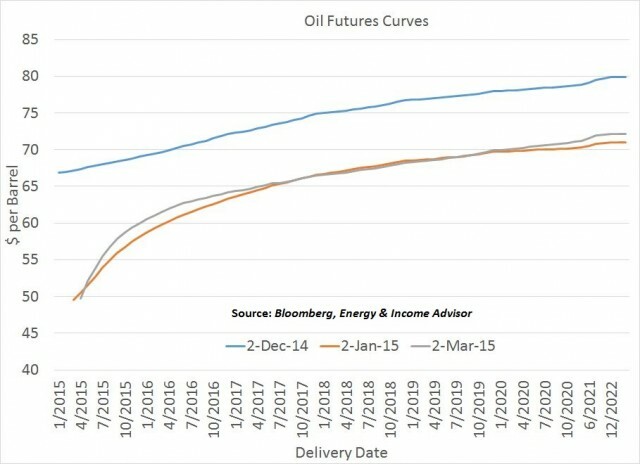 Weakness in oil prices over the past three months has been concentrated in spot prices and near-month futures, steepening the curve’s upward slope and putting the market in contango—a situation where the price of oil for immediate delivery is less than contracts for delivery six to 12 months down the line. 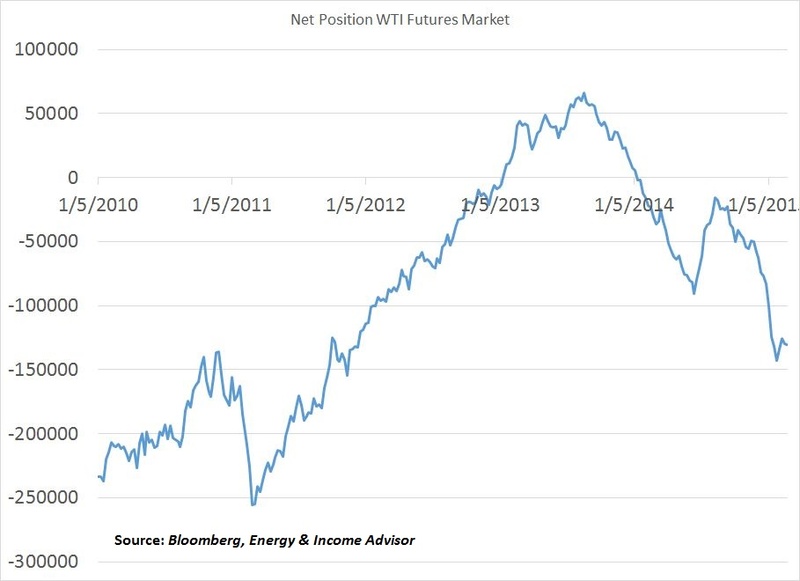 An oil market in contango has important implications for industry behavior and future prices. Let’s say you’re an energy trader with access to 1 million barrels of crude oil-storage capacity. Right now, you could purchase 1 million barrels of crude oil for $50 million and simultaneously sell 1 million barrels worth of oil futures for delivery in March 2016 for $61.5 million. As long as the cost of storing that crude oil for 12 months is less than $11.5 million, you would realize a risk-free profit. With this arbitrage trade, the spot price of oil six months or a year from now is irrelevant; you’ve already locked in the value of your 1 million barrels of crude at the current March 2016 futures price of $61.50 per barrel. In early December, the potential profit from this trade was much lower because the futures curve was flatter; three months ago, the difference between the spot and the 12-month forward price of oil was just $2 per barrel. 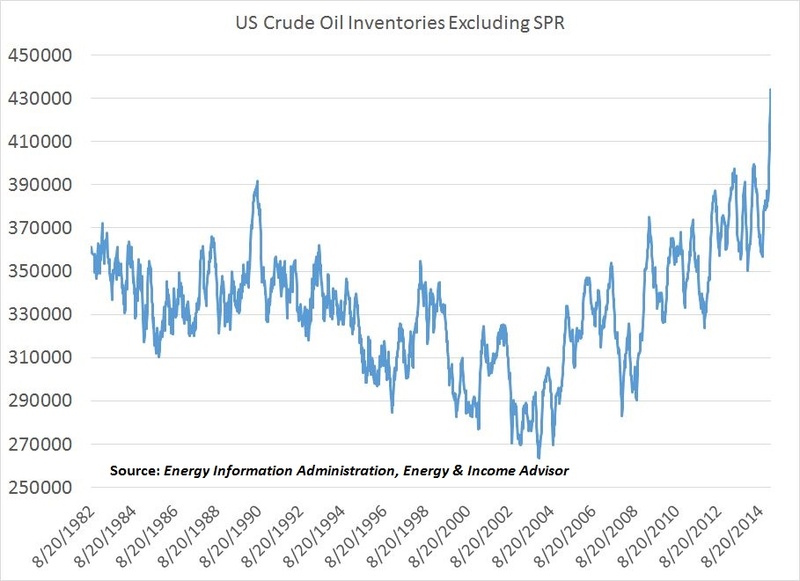 An oil market in contango incentivizes participants to store crude oil for future sale, a big reason why US inventories (excluding the Strategic Petroleum Reserve) have climbed to record levels and have accumulated at an unusually rapid pace. As long as the oil futures curve remains in a steep contango, traders, hedge funds, manufacturing firms, energy companies and even governments will have an economic incentive to store crude oil and add to the growing stockpiles. Meanwhile, the US energy complex continues to grow its oil output. Weekly data from the Energy Information Administration indicates that domestic production has reached 9.285 million barrels of oil per day, up from 9.121 million barrels per day in the final week of December. In other words, average weekly US oil production has increased by more than 160,000 barrels per day in 2015; the dramatic drop in crude-oil prices has yet to translate into a measurable supply response, a trend that reflects many producers’ plans to grow their output in 2015 while slashing capital expenditures. Because domestic demand for crude oil hasn’t grown fast enough to absorb this extra supply, more barrels will find their way into storage until consumption increases and production tails off. In the meantime, concerns have emerged that the US could max out its theoretical storage capacity, which comprises about 520 million barrels and another 100 million to 125 million barrels at producers’ well sites and in pipelines. Oil inventories have reached about 435 million barrels and continue to build; if US storage capacity fills completely, spot prices would collapse, forcing upstream operators to shut in producing wells. The market hasn’t reached this point yet, but storage levels at the hub in Cushing, Oklahoma—the delivery point for the WTI underpinning the futures contracts that trade on the New York Mercantile Exchange (NYMEX)—look set to eclipse the record of almost 51.86 million barrels. As inventories in Cushing surpass last year’s record, expect to hear more chatter about the potential for inflows to max out the storage capacity at this key hub. Although crude oil’s spot price has fallen sharply over the past three months, the price of oil for delivery a year from now remains comfortably above $60 per barrel—a level at which producers in the most prolific shale plays can still turn a decent profit. This situation encourages lower-cost producers to hedge some of their expected oil production in 2016 at higher prices to protect their earnings from more volatility and weakness in the spot market. Most oil and gas producers use over-the-counter swaps to hedge their expected oil output; however, the futures market can provide a rough gauge to hedging activity in the energy industry. Each week, the Commodity Futures Trading Commission (CFTC) publishes the Commitment of Traders (COT) report, which documents the positions of major traders in the US oil futures and options markets. The COT report shows the net position of oil producers, processors, merchants and users in NYMEX-traded WTI contracts. At the end of 2014, energy market participants were net short about 80,000 crude-oil futures and options contracts; today, their net short position has swelled to more than 130,000. This growing short position suggests that market participants expect further weakness in crude-oil prices this year; shorting oil futures provides protect against this downside. We doubt these companies would hedge this aggressively if the consensus expectation called for a modest, temporary dip in oil prices. Increased hedging activity will also help US producers survive a longer downturn in crude-oil prices by preserving cash flow in the face of falling spot prices. This phenomenon could delay additional cutbacks in drilling activity needed to reduce output and help alleviate the current glut of oil production in the US market. Against this backdrop, investors should regard the rally in crude oil and energy stocks from their January low as an oversold bounce and prepare for further downside for oil prices and exposed equities. Rapidly rising US oil inventories represent one catalyst for this drop. 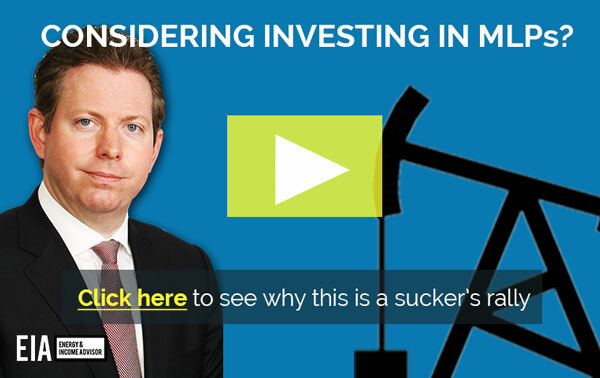 Before you load up on supposedly bargain-priced stocks like oil-field services Schlumberger (NYSE: SLB) or fracking-sand producer Hi-Crush Partners LP (NYSE: HCLP), I urge you to watch our latest video, which highlights some shocking risks in the energy patch.